SanMig Milyun-Milyong Panalo ~ Philippine Freebies, Promos, Contests and MORE! Want to win a FREE beer or an instant cash? 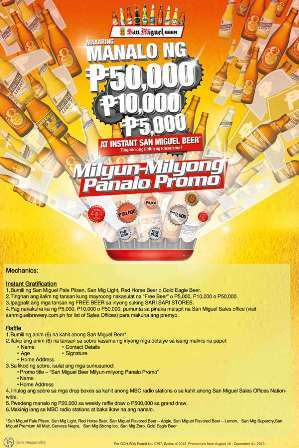 Start collecting bottle crowns for more chances of winning in San Miguel Beer's Milyun-Milyong Panalo promo. There are 2 ways to win. In the Instant Gratification promo, simply buy any San Miguel Beer variant and check inside the crown if you win a FREE beer or cash prize worth P5,000, P10,000, or P50,000. Swap your FREE beer crown at your local sari-sari store while you may redeem your cash prize at any San Miguel Sales Office near you. Want to win more? Collect six (6) crowns of any San Miguel Beer variant, enclose it in an envelope together with your contact details and drop it in drop boxes located at any MBC radio station or San Miguel Sales Office nationwide. Get drawn to win P20,000 in the weekly raffle or P50,000 in the Grand Draw. Promo Title - "San Miguel Beer Milyun-milyong Panalo Promo"